Soldering robot - Robotic soldering with atomized flux : COSMIC CORP.
Long life span and very little wearing in spite of contact-type soldering tip because our soldering robot is using ceramic. Variations of solder amount (which are deemed as destabilizing factor at soldering) are eliminated because solder is cut for supply and not be left on the soldering tip. Using the ceramic heater directly as the soldering tip enables controlling heat at will. 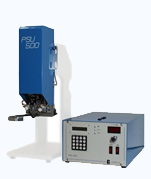 The PSU500(robotic soldering) can handle all kinds of soldering from fine parts to parts that require heat. 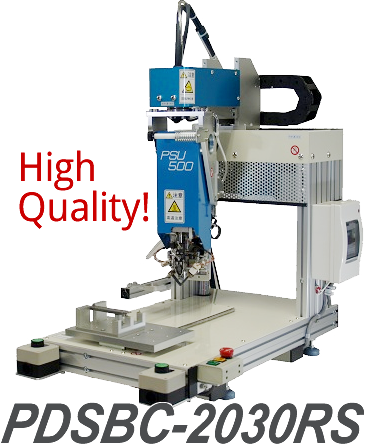 The PSU500(robotic soldering) allows soldering without nitrogen gas even for lead-free solder because high-temperature immediate soldering robot system. The two heaters/soldering tips efficiently transfer heat and make stable soldering both of “through-holes” and “back-fillet” together. This is the Cosmic's soldering robot system. We believe stabilizing the heat is important to improve the accuracy of soldering and stabilize it. The PSU500(robotic soldering) has achieved the quantification by cutting the solder and using ceramics on the soldering tip so that the melted solder would not adhere to it.We are using a ceramic heater which has the heating element inside almost top of it for stable heat supply. 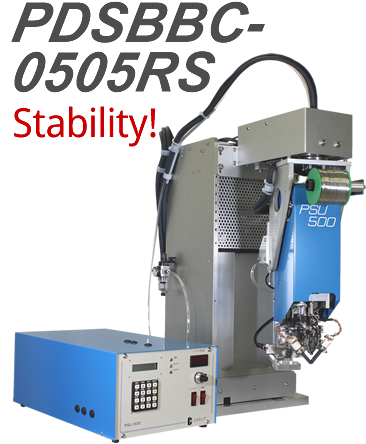 By our idea, the PSU500(robotic soldering) has achieved high-temperature immediate soldering (Operating temperature approximately 550 to 600°C.) But the temperature of the solder and electronic components will never reach 600°C. 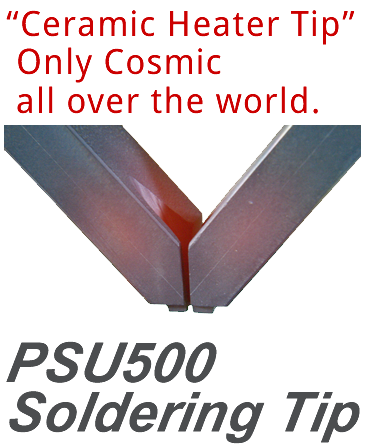 Soldering iron is useful only by hand tool, It's Cosmic thinking. Flux is atomized immediately when it contacts the high-temperature heater. 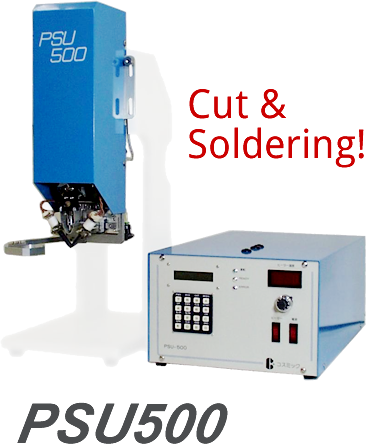 In our automated point soldering robot system (PSU-500), “Atomized Flux” (flux is atomized immediately on contact with high temperature) is always applied to the component before melted solder arrives. Click the photo on the above to watch the video. 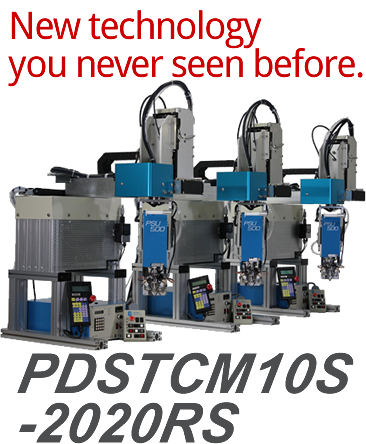 PSU500(robotic soldering) can extremely reduce the time for spending maintenance & adjustment on daily, weekly and monthly because all soldering data is digitized (NC control). We are company specialized for manufacturing soldering robot system. If you have soldering troubles below, please click for our solution. We will attend "Inter Nepcon Japan" which will be held from Jan. 16 to 18, 2018 at Tokyo, Japan. (Tokyo Big Sight : Our booth No. East hall No. 1-10) We are planning to show 3 kinds machines for your solution of soldering. For our users, you can get information and DVD for cleaning and adjustment tools. We are looking forward to meeting with you all ! We will attend "Inter Nepcon Japan" which will be held from Jan. 18 to 20, 2017 at Tokyo, Japan. (Tokyo Big Sight : Our booth No. East hall No. 1-12) We are planning to show 3 kinds machines for your solution of soldering. For our users, you can get information and DVD for cleaning and adjustment tools. We are looking forward to meeting with you all ! We will attend "Inter Nepcon Japan" which will be held from Jan. 13 to 15, 2015 at Tokyo, Japan. (Tokyo Big Sight : Our booth No. East hall No. 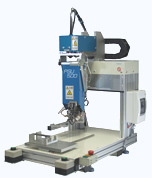 2-21) We are planning to show 3 kinds machines for your solution of soldering. For our users, you can get information and DVD for cleaning and adjustment tools. We are looking forward to meeting with you all ! We changed specification for life of soldering tip (ceramic heater). It was more than 2000 hours but now it is "more than 1 year" regardless operation time and shot count. We also offer new method cleaning, it brings more long life of soldering tip, please consult to Cosmic for details. We will attend "Inter Nepcon Japan" which will be held from Jan. 14 to 16, 2015 at Tokyo, Japan. (Tokyo Big Sight : Our booth No. East hall No. 1-28) We are planning to show 3 kinds machines for your solution of soldering. For our users, you can get information and DVD for cleaning and adjustment tools. We are looking forward to meeting with you all ! We will attend "TAITRONICS"(Taipei International Electronics Show) which will be held during October 6 (Mon) to 9 (Thu) at Taipei, Taiwan, booth No. I-1132. our booth and looking forward to see you soon. Soldering video for "USB A type connector" is now shown on our video library. Video for "USB B type micro connector" is also comming soon. We will attend "JAPAN JPCA SHOW 2014" which will be held during June 4 (Wed) to 6 (Fri) at Tokyo Big Sight, East No. 4 hall, booth No. 4A-07. In this exhibition, we will show new soldering video, especially for connector and cable. We all welcome for your visit to our booth and looking forward to see you soon. Thank you for waiting. Now, we would like to introduce your expected solder. This new solder is developped as suitable for our machine in cooperation with solder manufacturer. It is available for standard type and halogen-free type. This solder dramatically reduces oxide fitting to the heater because using flux appropriated for high temperature. By all means, we wish you consider it. It's inexpensive, less flux crack and more advantages. Now, sample is available, please contact to us ! We will attend "Inter Nepcon Japan" which will be held from Jan. 15 to 17, 2014 at Tokyo, Japan. (Tokyo Big Sight : Our booth No. East hall No. 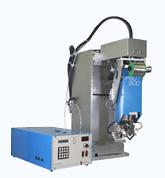 3-20) We are planning to show 3 kinds machines for your solution of soldering. 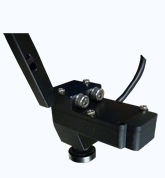 For our users, you can get information and DVD for cleaning and adjustment tools. We are looking forward to meeting with you all !